One shot of vodka, that is. 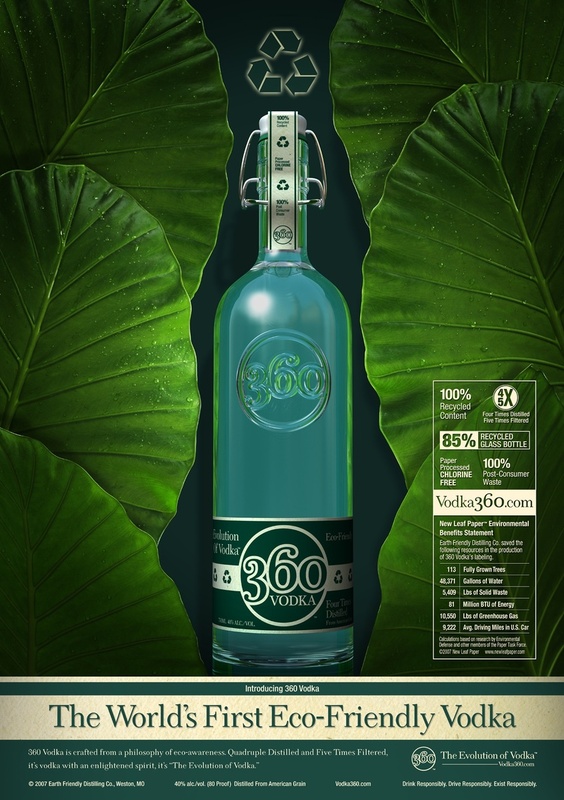 We've written about green brew before, but were intrigued to hear about the self-proclaimed "world’s first eco-friendly premium spirit," Vodka 360. So, why drink this vodka (as if one needs a reason)? The bottles are made from 85 percent recycled glass and the logo is blown into the glass (saving paper). When paper labels are needed, 100 percent post-consumer waste materials are used, as well as water-based inks. Every bottle also comes with a postage-paid envelope so that drinkers can mail back the flip-top cap for re-use. In addition, McCormick Distilling, America's oldest continually operating distillery and the manufacturer of Vodka 360, promises to donate $20 for every case purchased to Florida's Coastal Conservation Association. Now, there are other eco-friendly vodkas out there. Purus (which calls itself the world's first organic Italian wheat variety), and VeeV, made from the Brazilian açaí berry, which Dr. Nicholas Perricone told Oprah was his number one "superfood" (and if Oprah endorses it, it must be good). VeeV donates $1 per bottle purchased to the Sambazon's Sustainable Acai Project and, for every person who registers on its website, Purus will plant one tree in America. To which we say, bottom's up! 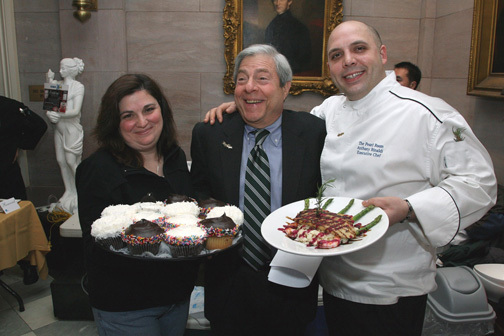 Brooklyn Borough President Marty Markowitz gets a taste of Brooklyn. I'm a big fan of D.C.'s Restaurant Week, where foodies can eat a multi-course meal at some of the city's greatest restaurants for a set price (this year it was $20.08 for lunch, $30.08 for dinner). Brooklyn has a similar deal, the fifth-annual Dine-In Brooklyn, which started on March 24th and goes through this Monday the 31st. Patrons dining at some 200 Brooklyn restaurants (including Michelin-rated spots) get a three-course prix-fixe meal for only $23. For a list of the restaurants and a map of their locations, click here, or search by neighborhood here. When I was in Churchill, Manitoba, last October, I went on a dogsledding excursion run by Dave Daley of Wapusk Adventures, which gave us a tiny but thrilling taste of what it’s like to be pulled by a pack of dogs who love to run. As soon as we entered Daley’s yard, the dogs—sensing that they were going to be running soon—started leaping straight up into the air like they had rocket blasters under their paws. But for the real, blood-sweat-and-tears version of dogsledding, there’s the annual Hudson Bay Quest. The HBQ, founded by Daley and friend Gerald Azure five years ago, is a 400-kilometer (248-mile) dog-sled race between Churchill and Arviat, in Nunavut. Designed as a test of self-sufficiency, racers must carry their own supplies and food for the duration of the race. This year, 20 mushers will set off March 29 with their dog teams across the frozen, often windy, and snowy tundra bordering Hudson Bay, prepared to face temperatures stuck in the minus 20s Fahrenheit. I spoke to Daley to get the lowdown before the race. How is the Hudson Bay Quest different from other dog-sled races, like the famous Iditarod? Well one thing is that we let the Inuit racers race with their traditional sleds and fan hitches. 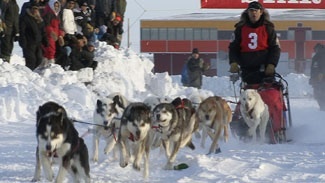 In a fan hitch, the dogs are each attached to the sled by their own line, in a fan formation. The more typical hitch system, used in the Iditarod and Yukon Quest races, is the gangline, where dogs are attached to one single line, usually in pairs. What inspired you to found the race? Living in a remote community, we do watch the famous dog-sled races, and we wanted to have our own Iditarod or Yukon Quest. I’m a Métis, and I saw it as a chance to get together the aboriginals of the north and revitalize traditional northern dog sledding. It’s not as long a race as the Iditarod but it’s pretty grueling. Every year so far we’ve had a blizzard at some point during the race. When I started, there were four teams out of Nunavut; this year there are 12. A lot of guys that hadn’t raced in awhile are getting back into it, and young people, a new generation of dogsledders, have sprung up. This is our opportunity to showcase our northern racers, although we do invite teams from the south. We have a lot of repeat racers too. Every year the race has become more and more popular. 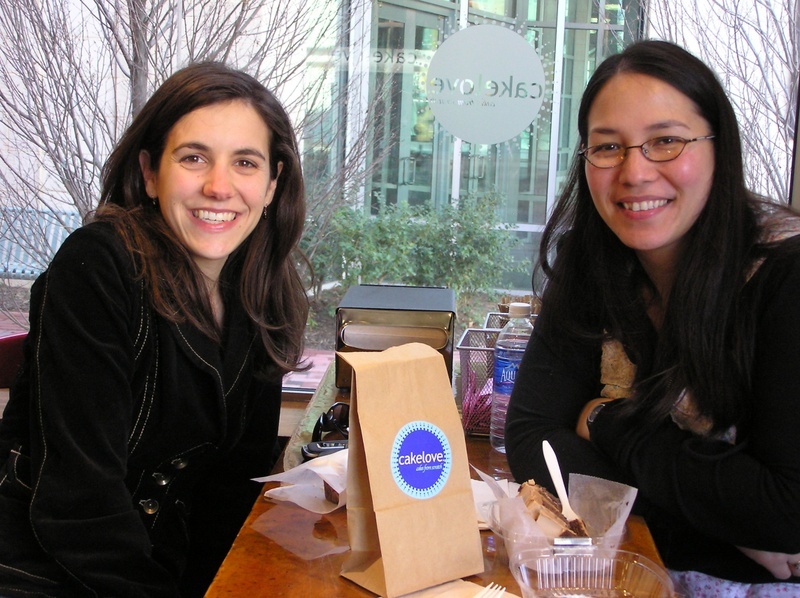 Friend of IT Marissa Bea, a theater student and recently converted vegan living in the Big Apple, knows that the foodie options in New York are endless. But where to start if you're looking for restaurants catering to the vegetable-conscious clientele? After six months of searching, Marissa gave us the low-down on some of her favorite vegetarian and vegan options in the city. 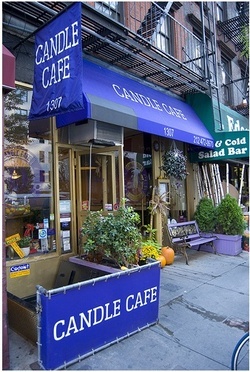 Candle Cafe (1307 Third Ave. at 75th St. 212-472-0970; pictured left) and more posh Candle 79 (154 East 79th St. near Lexington Ave.; 212-537-7179) both serve organic vegetarian food, from classic Caesar salads to the more innovative BBQ tempeh and sweet potato sandwich. Both spots also offer wide selections of beers, wines, and cocktails. Marissa recently discovered New Hampshire-originated Curly's Vegetarian Lunch (328 East 14th St. between 1st and 2nd Aves. ; 212-598-9998), a vegetarian diner (believe it or not) for "vegetarians, vegans, and sympathetic omnivores" that serves up "fakin'" (meat-free bacon) and veggie burgers. The NYC location opened in 2005 and has become a local favorite. Chennai Garden (129 East 27th St.; 212-689-1999) is an all-vegetarian kosher Indian eatery that dishes up some of the best curry, chapati, and dosai in town. Says Marissa, "Their service suffers... but their food is awesome and really inexpensive." We know it might seem a bit premature to be looking toward Shanghai’s 2010 Expo — after all, Zaragoza’s turn in the limelight this June is a lot more imminent (and focuses on water and sustainable development, to our delight). 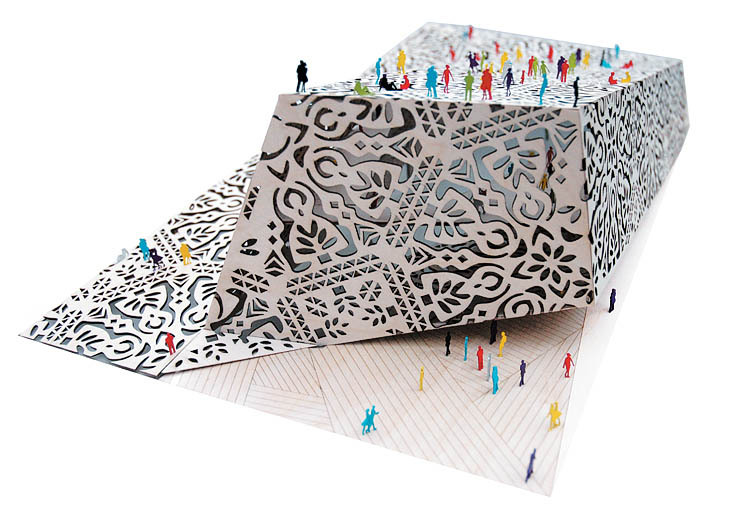 Sure, but the winning design entry for the Polish Pavilion is too cool not to dote on. The pavilion follows in the grand tradition of other architectural eye candy unveiled at international expos (aka World's Fairs). Though most expo structures are designed to be temporary, some have found grace and remained, such as, most famously, the Eiffel Tower in 1889 and Seattle's Space Needle in 1962. The Polish Pavilion's intricate cutout façade reminds us an awful lot of snowflakes we meticulously cut as grade-schoolers (but fret not: This structure is made of sturdy wood). Author, blogger, journalist, and inveterate traveler—Rolf Potts has made a name for himself as a champion of vagabonding—spending extended time on the road, often without a hard-and-fast itinerary. His book, Vagabonding: An Uncommon Guide to the Art of Long-Term Travel, and website, www.vagabonding.net, are chock-full of tips and first-person accounts about how to journey frugally and well. Brought up in Kansas, Potts traveled mostly in neighboring states as a youth. But the travel urge was planted, and he’s spent the past several years roaming the world, for long stretches with no fixed address. It’s a life many of us dream about but seldom undertake. Though Potts has semi-settled down on a farm back in Kansas, travel remains his abiding passion. Here he is interviewed by Keith Bellows, editor in chief of National Geographic Traveler magazine. Read more about Potts in the April 2008 issue of Traveler, and check out his list of favorite bookstores from his travels here on IT. Getting the shot: This shot was taken on opening day of Astroland/Coney Island 2006. Every year my friends and I bike down to hang out, put our feet in the sand, ride the Cyclone, and eat some Nathan's Famous cheese fries. 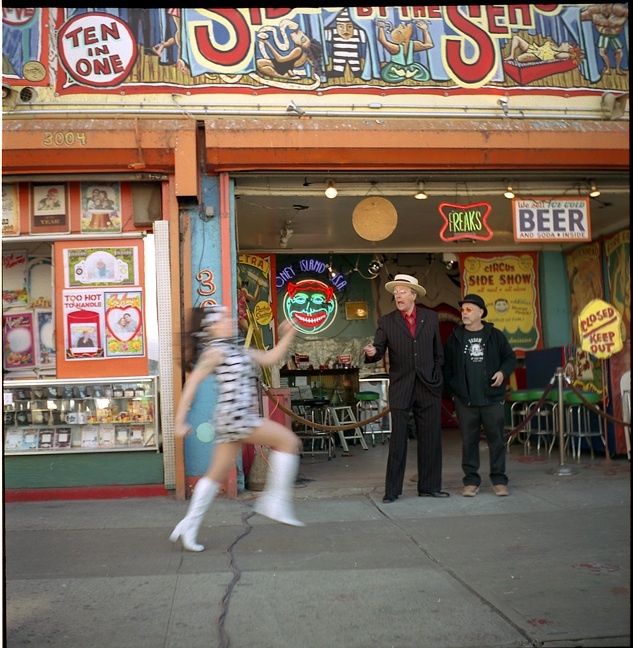 There were organ grinders and lots of Coney Island regulars hanging in front of the Sideshow when all of a sudden The Pontani Sisters ran by in matching outfits... and I grabbed this shot. I realized afterwards they were shooting a silent video (I think) and that's why there was a gorilla there that day as well! This picture really captures the spirit of a disappearing Coney Island. Lots of changes are in place now, and this year looks like it will be the last year of Astroland and maybe the Sideshow too. I hope the freaks and fun stay in Coney and that this new wave of "improvements" retains some of the original flavor. The Details: I was shooting film with my Seagull TLR medium format camera (a cheap version of the old Rolleiflex twin lens Diane Arbus used). Taste more of New York’s authentic flavor with the April issue of Traveler, on newsstands now, and right here at IT, where we’ve got the Big Apple for brains this month. Think you captured a “New York moment” on film (or, ahem, memory card)? Add it to our Flickr pool. The treks in the northwestern tip of Indonesia are an attempt to lift Aceh out of poverty by developing local tourism projects and reviving the crippled economy after a 30-year conflict and a devastating tsunami in 2004. So just as tourists in Vietnam can scramble through the Cu Chi tunnels used by the Vietcong in the Vietnam war, visitors to Aceh can see where the separatist Free Aceh Movement (GAM) hid from or fought against the Indonesian army (TNI) until as recently as 2005 when the two sides signed a peace agreement...[T]ourists scramble over sharp rocky trails, past teak trees cloaked in creepers, and alongside pristine waterfalls and sparkling rock pools. 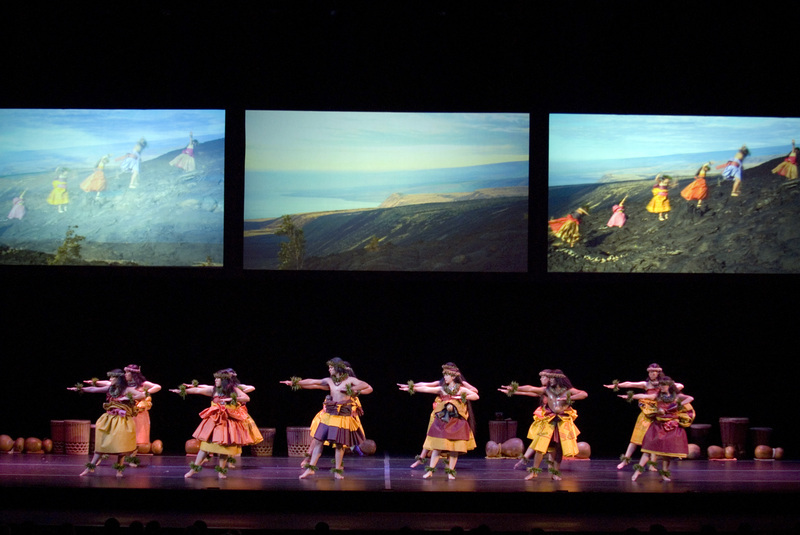 Can a national park be interpreted into a modern dance, or a piece of music? The next park to get interpreted? Glacier National Park. Look for it in the summer of 2009. Traveler Intern Catherine Pearson learned that sometimes the sweetest trip can be the one that you take without leaving your city. Ladies and gentlemen, we present you with a "Staycation." We were bound for Niagara Falls. My roommate and I had never been, and it was her requested birthday celebration. Yahoo! and Google both estimated drive time as less than 8 hours from just outside Washington, D.C. Expedia pinpointed a hotel just north of the border. By our calculations, we were ready to go. Then a glance at Weather.com froze us in our tracks: Winter snow advisory for the entire Northeast. Impaired visions of weighted-down windshield wipers and sealed-shut car doors chilled our revved-up plans. The perfect storm was toppling our last-minute birthday getaway. Crestfallen, we dove deeper into the web to find a toastier weekend vacation. But prices skyrocketed as the latitude plummeted. Admitting defeat, we hung up the mouse and went to bed. My roommate would have to settle for cake and ice cream without waterfalls. Revelation settled in overnight, like a silent snowfall. D.C. is a destination for travelers. Why not make it one for residents? Travel is my roommate's first love, but chocolate is a close second. If museums and politics were the meat and potatoes of D.C., then we would partake in the capital's desserts.